What It’s About: The demon Pitch’s dancing practice is interrupted when he’s sent to Earth to ruin Christmas by making children evil. It’s up to Santa Claus to defeat the demon’s incredibly limited reign of terror! Lending a hand are Merlin the Magician and a couple of kids that hang around the workshop singing cliché regional folk songs. Utterly charming for its earnestness, Santa Claus mixes the miracle of Christmas with the battle for the eternal souls of children. The bold drama of the central concept is largely defeated by the onscreen antics of Pitch and Santa Claus and by the laughable (yet horrific) machines at the North Pole. Why Watch It Today? 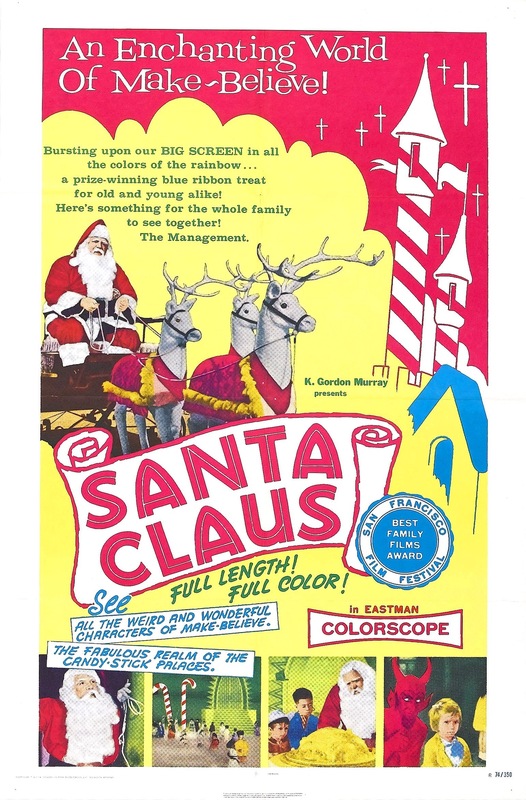 : Santa Claus is one of several Mexican children’s films distributed in the USA by K. Gordon Murray. Often surreal, and sometimes accidentally nightmarish, these films left a lasting impression on a generation of America’s youth. Today they are nostalgic oddities, cherished reminders of a time when parents could dump their kids off at the movie theater without knowing or caring what they’d be watching. K. Gordon Murray, purveyor of nightmare fuel, died on December 30, 1979. This entry was posted in Based on Myths, Comedy, Demons, Family, Fantasy, Holiday, Movie of the Day, So-Bad-It's-Good and tagged Christmas, Merlin, Mexico, poverty, Santa Claus, spoiled rich kids.